Oh, dear, Abaddon's done it now. He's got me thinking about a Christopher Lambert Highlander fig, thanks to his pondering in this thread. Now I've just got to have a go, haven't I? So I've had a potter around for some reference (oddly enough, I can only seem to find the same two or three pics over and over again) and come up with a couple of loose sketches. Whaddaya reckon for starters? That looks GREAT! Immediately recognizable. Very nicely done - you have the touch, that's for sure. Fig looks like its off to a good start, but shouldn't the sword be different? I remember him weilding only either a katana or a claymore, but it has been a LONG time since seeing any highlander. Somewhat unrelated note, was highlander source as god awful as people say it is? I'm not sure about the claymore, but I have a feeling it was the guy from the series (Duncan?) who used a katana, not Connor. That's his claymore in the pic..... he switches to a katana later as he can hide it up his coat Connor takes the Katana when Ramirez is killed. He leaves the Claymore as a grave marker for Heather. A claymore is over four feet long, so tricky to sneak around in the early eighties! The photo makes it look a little shorter, he barely uses it in the film, just in some of the flashbacks. 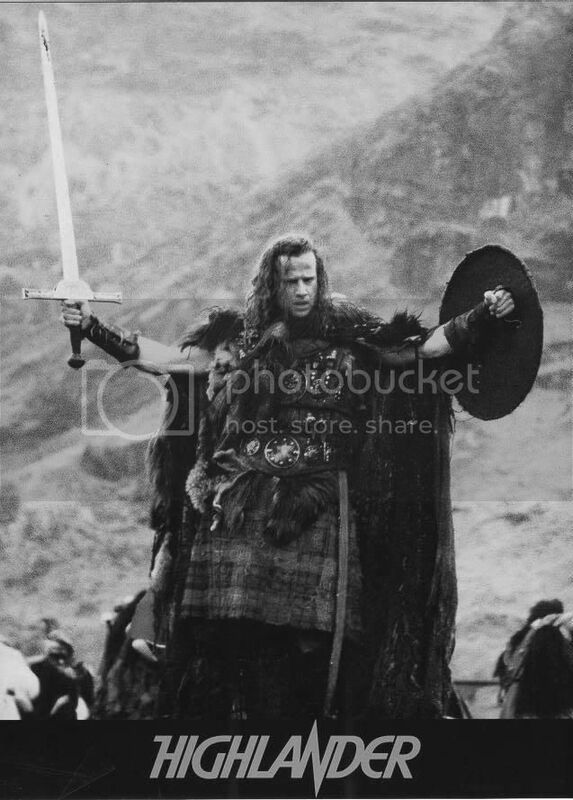 It's just that the iconic Highlander image is from a tiny portion of the film. Ah, gotcha. So that pic makes it look shorter, and my fig even moreso! But then since the fig's designed to be cut out, I'm not sure I'd want to make it too long and thin, so maybe a little artistic licence is called for anyway. 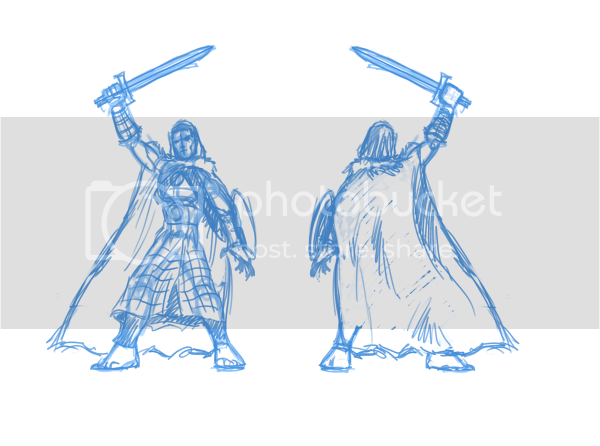 Actually, if this works, out, maybe I could knock out a few more Highlander-style figs, like modern Connor, Ramirez, Duncan, maybe Kurgan and Quentin. As long as I could actually find some reference for them; I don't actually have any of the films. Yeah, I know about the sequels. Apparently the series actually got pretty good from the second season, but I've only seen odd episodes; it was always on at a weird time, so watching regularly just never happened. Then it's said to have gone downhill right near the end, and then culminated in the Source, which, like I said, appears to have been pretty diabolical. Yup, the pic is at a low angle (up the kilt shot). So it forshortens the sword. A real one is about 55" long, the one in the film is only listed as being 43" in the replicas (but prop replicas aren't allowed to be accurate for some reason). Anyway, it was a big bugger. I'd imagine he used a fair few different swords in his travels anyway! If you waved a claymore around the way he is in the photo then you'd be too knackered to fight. 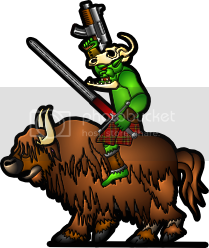 Maybe have a claymore strapped to his back? It's a superb drawing though, I wouldn't change it. Stick with artistic license. Yup, I vote keep the sword you have... looks dang cool! I kinda prefer the 2 hander myself, but I'm sure whatever sword you give him will look great! Actually, I guess I could stand to extend the hilt a bit, just for the effect. I'm just reluctant to make the actual blade any longer for fear of weakening it, even though by rights it should be a fair bit longer and thinner than I've drawn it. You could lower the angle and anchor the blade on the head a bit. That way it would only be the bit over the mini that would be thin. Hmm, that's a good thought. My only concern is that the pose may not work as well. But it's worth a try - I'll have a go on a copy in a little while, see how it works. Could you work up the one you've done then modify it to hold a claymore? Okey dokey. I haven't had a chance to get him coloured yet, but I've got the lines finished and cleaned, so here he is! Colours hopefully very soon; I'm just about to start flatting him. The pose and anatomy look good. This should color well and look really nice with highlight and shading. Yeah, like Jim I can't wait for your coloring job! Thanks guys. I've actually just knocked out a quick test print of the b/w lines, just to test the scale, and I'm happy with how it's come out, especially considering it was done entirely digitally (meaning I couldn't guarantee exactly what size it was going to be). Sharp line work! Very nicely done. Aaand we have a completed fig! Surprisingly, I even managed to get the sides lined up first time. I've tried a test build and he seems to work just fine. MIGHTY fine work there my friend! I really like the kilt and how absolutely 3D it looks! The face is also a standout... excellent job! Looking forward to MANY more figs in your style! Great figure! It makes a good "Braveheart", too. This is a great end result. Just wondering if you would do a second version - all the same but still a beard on him and colour the hair darker. No real reason but it would be fun to have two version. Very, very cool!Really like the dynamic pose! Heh. Yeah, I thought of that, too. Bit of blue felt-tip and you're away! Why the heck not - sounds like a whole two minutes' work. What sort of beard did you have in mind - full? Goatee?